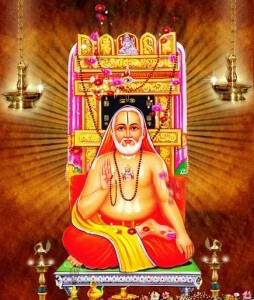 Guru Raghavendra (1595-1671), is a great Indian saint whose followers number in the millions. The saint, an exponent of the Dwaita School, is particularly revered by the Madhwa a section of Brahmins. Where can I visit Guru Raghavendra’s shrine? There are shrines devoted to the saint in the states of Tamil Nadu, Karnataka and Andhra Pradesh in South India. Devotees can visit Sri Ragavendra Temple at Mahanathapuram, Kanyakumari and can get the shrine of great saint. KaariyaSiththi Sri Ragavendra at Mahathanapuram offers shrine and blessing to all devotees. The special blessings from KariyaSiththi Sri Ragavendra make the devotees finsh their all kinds of work at time. Check the Temple Location link to know details about reaching the temple. Devotees may also visit the Guru’s Jeeva Samathi at Mantralayam in Andhra Pradesh. Mantralayam is located near the town of Kurnool on the banks of the River Tungabhadra. Mantralayam is located on the Chennai Mumbai rail route. We invite all devotees to join us & get blessings from Sri Raghavendra Swamy. Varushabishekam of Guru Raghavendra Swamy Brindavan Kanyakumari will be celebrated on 22/02/2018 (Thursday). We invite all devotees to join us & get blessings from Sri Guru Raghavendra Swamy.